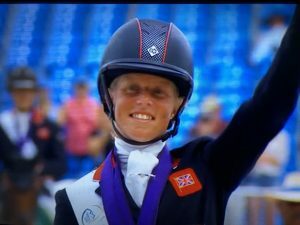 Wow, what a weekend for Brand Ambassador Ros Canter, Crowned Double World Champion at the World Equestrian Games in North Carolina. Ros not only won the Individual Gold Medal but she was part of the Gold Medal Team representing Great Britain a huge achievement for Ros and Alby not forgetting the amazing team she has behind her, including Emerald Green Feeds Brand Ambassador Sarah Charnley who was at WEG with Ros as her groom. We are incredibly proud to sponsor Ros Canter Eventing and look forward to seeing the many more accolades we know Ros will achieve in the future.